At C.F. Martin & Co., they design their strings like they design their guitars â€” with maximum performance, exacting tone, and playability in mind. They know that musicians demand strings that will perform onstage, in the studio, or wherever their music takes them. 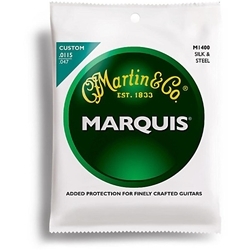 Martin strings are designed to deliver excellent tone, clarity, and response and are made from the highest-quality materials. Choosing your strings is very serious, so make the most out of your next restringing and choose Martin acoustic guitar strings.